There was an added feature on the program, an exhibition 145 pound match and in that Leonard Fair threw his opponent. Had that contest counted the two teams would have tied for the scoring honors of the evening. Charles Vennemann, Bill Rickerson and Jess Brouhard are the Chillicotheans who threw their opponents to win five points each for their team and Russell Taylor took his match by decision which gave the team three points. A crowd of more than 100 persons saw the mat meet and were enthusiastic in watching the various boys on the canvas. Wrestling Meet Held in Kansas City, Kansas, Yesterday, a Return Affair. 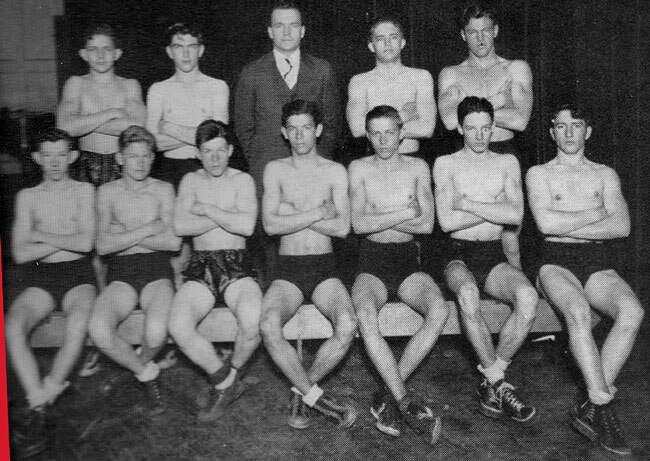 Three Chillicothe boys failed to make their weights, being a few pounds too heavy, and this meant that they had to meet opponents who were much heavier than they were themselves. This was especially true of Bill Rickerson and Taylor both of whom were defeated. Charles Vennemann was slightly outweighed by his opponent but he manages to throw him for a fall victory. Jess Brouhard, local heavyweight who is picked as a possible state champion in his weight this year, won over the Kansas heavyweight. Leland Fair and Stewart were other local boys who chalked up wins. Applebury of the Hornets tied with Day of Wyandotte. It is very seldom that a wrestling team makes a clean sweep in a match with another school but the Chillicothe Hornet wrestlers went that far and a bit father when they defeated the Mexico Military Academy team 45-0 yesterday afternoon at Mexico. They won every bout by a fall. From the lightest man on the team to the heaviest man the local boys were able to pin their opponents back on the mat before the seven minute time limit had ticked away. Vennemann was the fastest worker of the group with a 20 second fall to his credit. Brouhard managed to win in only 38 seconds and Fair took just one minute. All of the boys who won their bouts at the same time won their school letter in the sport for the rules are that a boy must win one bout or place in the state meet. The state meet is to be held in Columbia on March 8th and 9th and the whole team will go to compete. In an exhibition match following the regular nine bouts, Jimmy Stewart, 115 lbs Hornet, wrestled a 135 pound M.M.A. cadet by the name of Fortites. Stewart nearly had the bigger boy down several times and only the weight advantage held by his opponent prevented his getting a fall victory. After the seven-minute tussel he was given the decision 13 to 7. Leland Fair won the 165 pound mat championship in the annual Missouri State High School wrestling meet held in Columbia last Saturday and the entire Hornet squad took fourth place honors in the affair with four members of the team placing third in their weights. The Hornets who placed third in their divisions were Veneman, Joe Vale, Leonard Fair, brother of Leland, and Brouhard. Last year Brouhard won second with both Vennemann and Leland Fair were third. Coach Pat Bradshaw took the team of nine wrestlers to the state affair after hoping to move up a notch from the third place that the Hornets won last year but competition from the big St Louis schools proved too much. Normandy high was first with 32 winners,. Maplewood was second with 26 points and Ferguson was third with 21 points. All three schools are in St Louis. 165 pounds-Leland Fair-State Champion-drew bye in first round, beat Fillo of Webster Groves in second and Wisman of Maplewood in finals.